1887 Photograph Captures Glimpse of Rural Anacostia | Park View, D.C. I recently acquired the above photograph that captures a moment in Anacostia in 1887. The full description (both printed and written on the back) is as follows — “A scene in Dr. Christie’s Garden. Photographed Nov. 3, 1887, by Max Georgii, assisted by C.H.R. of Washington, D.C., on their photographic tour across the Eastern Branch.” While it is impossible to tell with certainty, the person in the photograph is likely the photographer, Max Georgii. 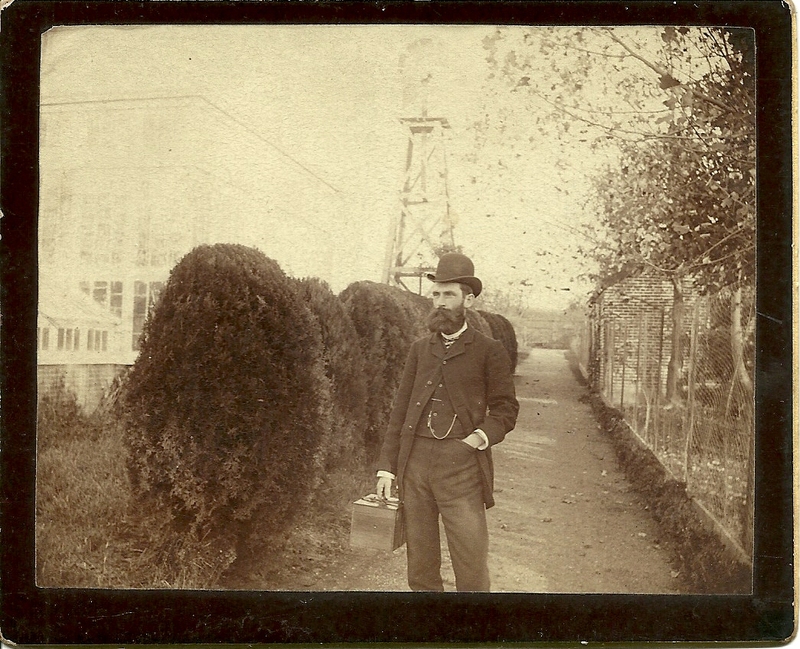 The photo shows a wire fence on the right, greenhouses on the left, and a windmill in the background. Dr. Arthur Christie was a well-known and highly respected resident of Anacostia. He died suddenly of heart disease on June 24, 1891, leaving a wife, son, and daughter. He was nearly 60 at the time of his death. 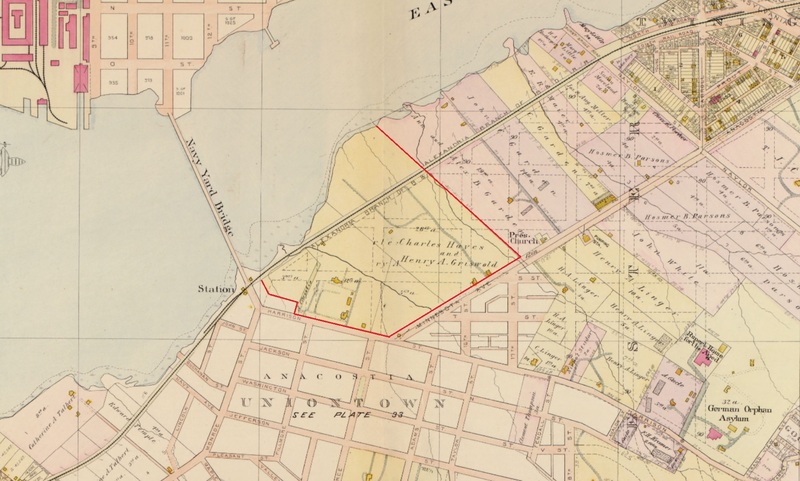 The map below, from the 1903 Baist’s Real Estate Atlas of Washington, shows where the Christie property was located. The Christie property was eventually subdivided in 1911. The following article from the Washington Herald, published on July 2, 1911, provides more background on the property. Real estate circles of Washington and the District are much interested in the recent purchase of Mr. Oscar C. Brothers, the well-known dealer in real estate, of the famous old Christie property, which is located in Anacostia, just at the eastern end of the Anacostia bridge. The property acquired by Mr. Brothers consists of fifty acres of splendid residential land situated in a charming spot. This property was for years the home of the late Dr. Christie, who as a very young man came over to this country from England and settled in the city of Washington, where he practiced medicine. Becoming successful in his practice, and after having accumulated what was regarded as an ample fortune in those days, Dr. Christie retired and spent the remaining years of his life in comfortable leisure. His family was one of the most aristocratic in England and he was a man of culture and education. The old house, which still stands on the property and which is yet in good state of preservation, was the scene of many of the notable entertainments of the Capital City more than half a century ago, for Dr. Christie was known as a lavish entertainer and the men and women who were bidden to partake of his hospitality counted themselves fortunate. Mr. Brothers has renamed the place “Fairlawn,” and has subdivided it into attractive building lots, which he is now offering for sale. The property is ornamented by a fine grove of trees which afford ample shade for the homes that will be built on the land. For some time past Mr. Brothers has had a force of forty men at work clearing up and cutting streets through the place. The tract faces on Harrison street (today Good Hope Road) and Minnesota avenue for a half a mil, and these streets are paved and asphalted and have sewerage, gas, and water mains. Directly opposite the property is a schoolhouse for white children which was erected at a cost of $75,000; a fire engine company is jut a block and a half away, and churches of all principal denominations are within four blocks. Fairlawn is easily accessible from all sections of Washington. Direct cars leave Ninth and F streets every three minutes. It takes about seventeen minutes to make the trip from Union Station and thirteen minutes from the Capitol, so that the shopping and bushiness districts of the city are within easy reach. Mr. Brothers will throw the property open for inspection on Tuesday, July 4, and he has extended a cordial invitation to the public to be present. For amusement he has secured the Naval Band, and other attractions will be provided the visitors. A very interesting feature of the inspection on the Fourth will be the awarding of $75 in gold coin by Mr. Brothers. He offers this amount for the best suggestion, submitted by any person on the grounds on the day of the inspection, for the name of a street to be cut through the property. For the best suggestion the prize will be $50, for the next best $15, and for the third best $10. The advertising managers of the four Washington newspapers will be the judges of the contest and will award the prizes. The advertisement below, from the Washington Time, includes the names of the contest Winners. This entry was posted on February 19, 2015 at 7:01 am and is filed under History. You can subscribe via RSS 2.0 feed to this post's comments. Great post! Dr. Christie and Frederick Douglass were neighborhood confidants and associates.